I decree and I declare, you have entered your week of manifestation. What was closed you will see it open up this Monday. Whatever was locked. Whatever was closed. Whatever was stolen or denied is COMING BACK. So shall it be! There’s another world that we can’t see with our natural eyes. If God were to pull back the curtain, you would see into the invisible world; you would see all these forces that are for you. Powerful warring angels at work on your behalf, standing guard, protecting you, pushing back the forces of darkness. You would see God moving the wrong people out of the way, lining up things in your favor, arranging good breaks, healing, deliverance. Don’t get discouraged by what you see with your physical eyes. Through your eyes of faith, you need to see every obstacle that’s holding you back surrounded by the Most High. Amen, I receive it in Jesus Name. Father, l need your help show yourself in my life, l m so tire. Daddy please pray for me. My prophet Alpha Lukau, thank you for the powerful miracle. I love you. Please remove my obstacles and return what was stolen from me in the blood of Jesus Christ. open the door of your blessing and rain it upon me. thank you Jesus, thank you. Let me yours forever. Daddy i need a total healing of my body, and pray for my entire family too. God bless you with your family in Jesus Name Amen! Amen. Let it be as said. Lord changes my story to celebration one by one 🙏 in Jesus name. As the spirit of god is upon me, and the spirit of god is within me i decree and i declare doors are opened for me, my family , my congregation and my pastor.we are serving the most high in jesus name i pray. Amen. So shall it be Papa, miracles, miracles this week I receive, God please open doors for me that we closed before, unlocked everything locked in my life in Jesus name, amen. I REALLY NEED A MIRACLE THIS WEEK, IN THE NAME OF JESUS THIS IS MY WEEK. I need it and I receive it in the powerful name of Jesus. Lord, please let this be my day , week of manifestations of miracles n my life in Jesus name. Amen. Thank you Lord Jesus and thank you Pastor Lukau. God bless you continually. thank you I receive in Jesus’s name. Blessings be upon you too. for my financial breakthrough, i m very difficult from the debt…. l receive in the Name of JESUS amen. THANKS. I recieve in the name of jesus. 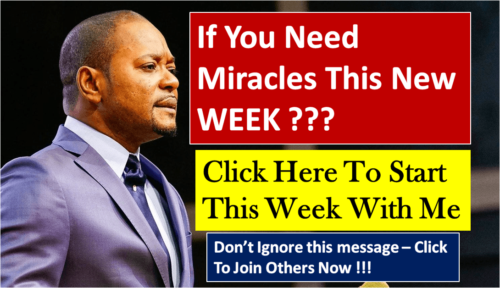 Yes Pastor Alph Lukau I stand in agreement with you for a miracle. I receive in Jesus Name. Please man of God,pray for my finances, Iam in 21000pngkina in debt with the BSP bank. And 4000pngkina with the moniplus limited. Pray for giant warring angels to cancel my debts. I trust you man of God. Bless you. Bless the Blessed Most High. I ask this prayer in Jesus Name. Amen.